When it comes to siding in Hillsborough, North Carolina, no company can offer quite what The Aluminum Company of North Carolina can. That’s because we’ve been in business in this area since our founding in 1961. 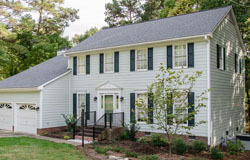 Back then, we started out providing homeowners throughout the Research Triangle with high-quality aluminum siding. In the more than 50 years since then, we have evolved with the times and stayed on the forefront of the most popular home exterior products on the market. Today, we offer several different types of siding, all of which are among the finest available. Beyond just that, though, we’ve learned that no home improvement product, regardless of its quality, means anything at all if it is not installed properly and precisely. Because of that, we only allow the most highly-trained and experienced technicians to complete our installs. And, on top of that, we proudly back all of the work we provide with a lifetime labor guarantee. To gather additional information about the various types of siding that we can install for you in Hillsborough or any nearby community, please contact The Aluminum Company of North Carolina today. We will be pleased to explain our product offerings in full, and we can even offer you a no-obligation pricing estimate.